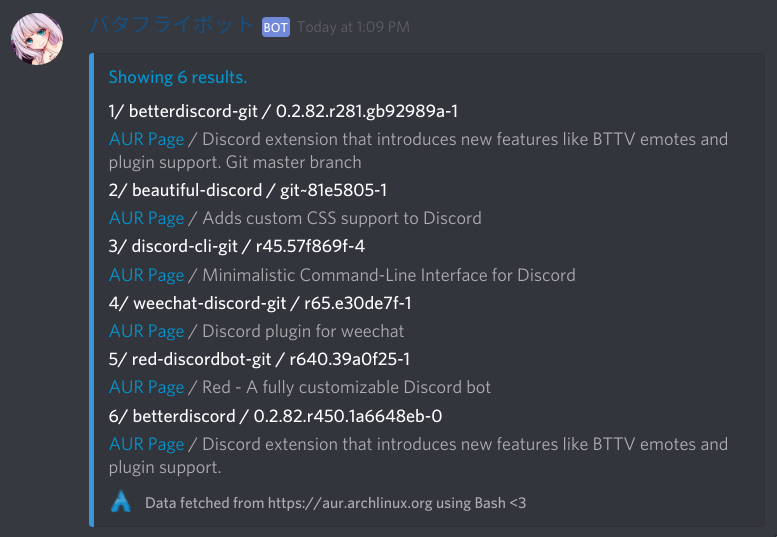 A pretty feature Discord bot that can fetch information such as osu!, Kitsu, Spotify, and many more! Updates are found in the Support server, along with support (of course). 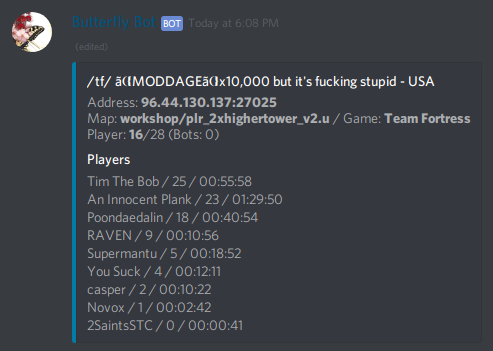 /vote/ Voting for the botBeam me up! /osu/ osu! 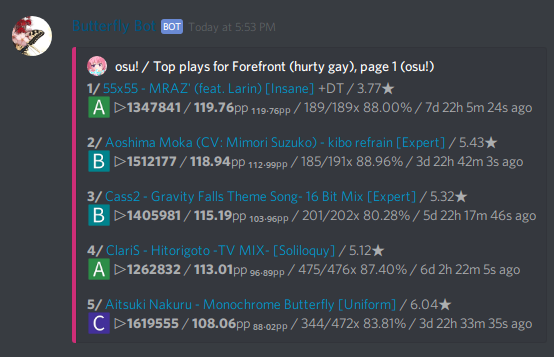 related commands, including beatmap searchBeam me up! ~compare fetches bot messages and sort them in a list to easily compare scores. /kitsu/ Kitsu related commands, for looking up anime and mangaBeam me up! /np/ Now playing, for showing off or just easier sharingBeam me up! 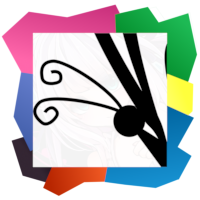 Idea from the np command in osu! /arch/ Arch Linux related commands, for looking up AUR or Repository packagesBeam me up! /sourcequery/ Sourcequery, queries most Source serversBeam me up! /spotify/ Spotify, for when you want to look up songsBeam me up! /saucenao/ Saucenao, to reverse lookup images in serverBeam me up! The rate limit is 1 command per minute, with a global limit of 30 commands per 30 seconds. Blame Saucenao for this. /twitch/ To query Twitch streamersBeam me up! Time set will soon be used throughout the bot, such as in printed dates, etc. Note: ~calc accepts bc -l or the standard math library. /wttr/ wttr.in, a simple weather report siteBeam me up! 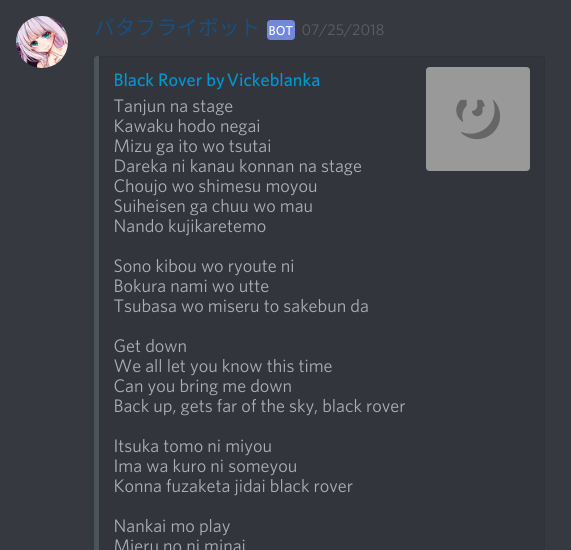 /lyrics/ Genius, for when you need to look up lyricsBeam me up! Or maybe sing Despacito, who knows? /c99/ Misc queries (WIP)Beam me up! /miscellaneous/ Toggle and Random Choice GeneratorBeam me up!